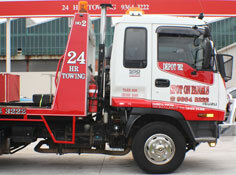 Spot On Panels offers a 24 Hour, 7 day a week towing service. If you have had your car towed to another shop it's never too late to change your mind. We will organize to have your vehicle transferred to one of our Professional Smash Repair Centre's - Free of charge. State of the art tilt tray trucks guaranteed not to damage your vehicle.